I’m using Bruce Shelley’s Church History in Plain Language for the second time, and it’s the kind of book you appreciate all over again. (Ryan Reeves was right to recommend this book to me.) 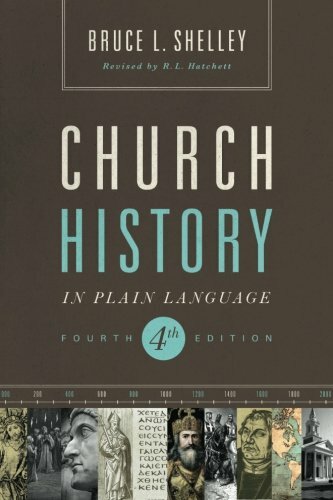 There aren’t many introduction to church history books that are as well paced; most are either too simple, with lots of tables and boxes, or too complex (the dreaded Justo Gonzalez volumes, that I and other grad students struggled with). In contrast, Shelley reveals his thoughtful teaching experience in his choices and style. He makes smart assumptions, such as people are more interesting than complicated movements and causes. “Without ignoring ideas, I have tried to wrap thoughts in personalities, because I assume most readers are interested in meeting other people” (p. xii). His writing is crisp and has momentum: “From years of teaching I have also concluded that clarity is the first law of learning” (p. xii). Chapter 1 opens with, “Christianity is the only major religion to have as its central event the humiliation of its God” (p. 3), which is a clear and interesting sentence – who wouldn’t want to read on? This is not to say the book is without imperfections. He neglects the American civil rights movement completely, which seems odd given the important role churches played in those pivotal decades. His Protestant, evangelical bias also strongly pops up rom time to time, as when he states that the monastic lifestyle is unnatural and flawed (p. 132), or that Scholastic theology reached too far (p. 213). He has little sympathy for medieval or modern Catholicism, and thinks of Christian faith as an inward, spiritual status of grace versus law. I don’t blame him for having a voice and a bias, but a bit more generosity and awareness would be nice. Part of the issue is the success of the book; he has a Protestant, evangelical audience in mind, but it has found a wider readership. Despite these frustrations (which can be thoughtfully addressed as part of the classroom), it remains the best book for introducing church history.